GO Launcher EX - It doesn't get much faster than this! There are so many launchers on the Market by now—but my own personal holy trinity is still composed of LauncherPro, ADW Launcher EX and this new kid on my block: GO Launcher EX. Read on and find out why this launcher has secured a place on my tablet (whose resources are somewhat weaker than they used to be). 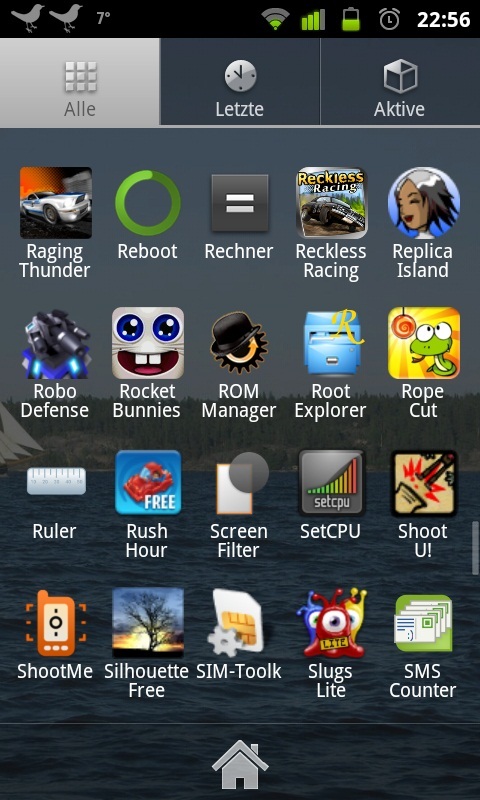 GO Launcher EX is a lot like ADW Launcher EX, and not only as far as the applications’ names go! That being said, this launcher is far more than a simple clone—one of its principle advantages being that draws on your Android’s capacities in a very energy-saving manner. If you’ve used ADW the following will come as no surprise to you: GO Launcher EX’s functions aren’t apparent right off the bat, meaning that you have to go to the launcher’s settings in order to get an idea of what it can do. Use Display settings in order to hide the Android status bar; (de)activate the mobile background when scrolling; hide app name as well as set the homescreen’s grid interval. Aligning the grid refers to arranging the icons according to how many of them can fit onto the homescreen—choose between 4x4, 5x4 or 5x5. 5x5 is very convenient if you’re using the app on a tablet, so thumbs up for that. Add homescreen pages and set them as your standards using Screen settings. A simple glance suffices to view the entire content of your homescreen, and you can fit up to 30 homescreens. Dock settings lets you select which design you want, how many dock pages you want, as well as a great little function that notifies you how many unread messages and missed calls you have. 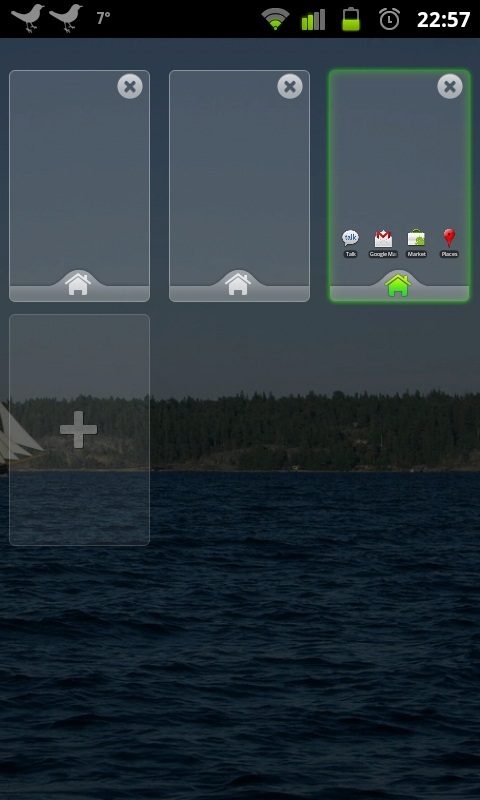 Use your SMS, phone or Gmail icons in the dock. For those of you who aren’t quite sure just what an App depot might be: this refers to app lists. You can set your own background, the grid interval, hide apps and change their sortation. I found the function that hides apps to be especially useful for users who have “Bloatware” preinstalled on their smartphones. If you want your homescreen to follow the movements of your device (that is to say that if you tip your phone one way or the other the homescreen will follow suit) go to Functons settings and make the appropriate adjustments. If you ask me, this function is useful if you’re using a tablet more so than if you’re using a phone, but that’s purely a matter of taste. You can also set gestures. Swipe down across your homescreen in order to drag the Android status bar down. Advanced settings are useful if you don’t want to the system to close the launcher, meaning you won’t ever have to wait for your homescreen to reload. This also means that another app will be shut down when your system is low on memory. The font face is also meant to be adjustable; I wasn’t able to find any alternatives to the typography used in the launcher, however. Themes can be set and downloaded using Themes settings. This feature further shows to what an extent an app can be personalised! Brilliant! There are loads of themes to choose from and, if you are so inclined, you can even design your own themes. All of the settings mentioned above can be saved and recovered. Aside from all your apps you will also find two tabs at the top of the display in the App list: recent apps and active apps. Use the latter to close all your apps—or rather DON’T: I can’t recommend this function as the launcher doesn’t do a very good job and will it will ultimately do your Android more harm than good. 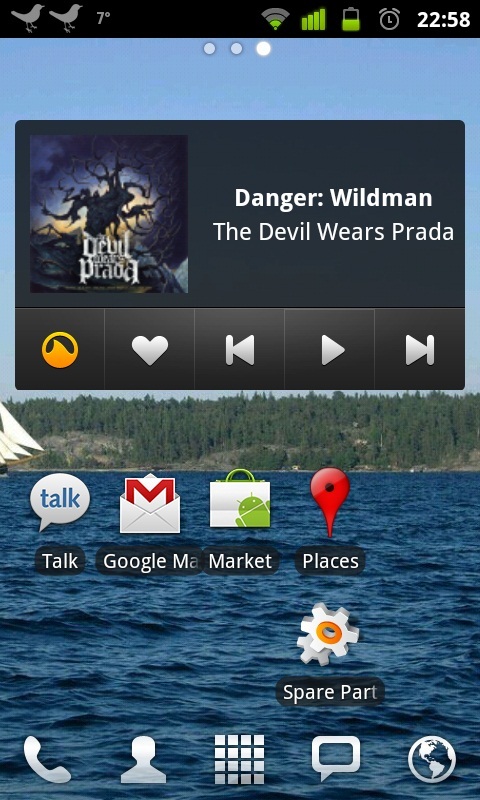 Lastly, I also like that you can change the size of the widget, just as with Motorblur by Motorola. Bottom line: GO Launcher EX has a lot of truely useful functions and it looks great, too: definitely worth giving it a go! You will find that homescreen controls are the same as with any other launcher. It was easy getting the hang of and finding my way around GO Launcher EX’s settings. GO Launcher EX rocks this category! It is without a doubt faster than any other launcher that I’ve had the pleasure (or pain) of testing, which is why it won’t be disappearing from my Pearl Touchlet Tablet any time soon. Hat’s off! The launcher did not crash during testing phase. GO Launcher EX can be downloaded free of charge from our App Center as well as the Android Market. GO Launcher EX i used this launcher from last four years now i buy samsung galaxy A7 2016 i want this launcher in my new cell but its not working properly this launcher really awsm. what is the best launcher for a htc magic with android 2.3.4??? I have installed the app yesterday via Android market, and still gives me a wow every time I use my phone. When I get the most out of the App I'll be writing a more in-depth review. For now I would say its a Must-have APP. I agree with the Trinity ! Lately, adw has had multiple fc's and other lag. I grew bored with lp awhile ago, no scrollable widgets! And other issues. After trying several others, ( crazy desktop, open home 6, which are okay, but buggy ) and this is making android fun again! Way more customizable than the other.. It just needs some more themes.. What I like also is there co-apps, go sms, go contacts etc. this is a good app but you can't use the wigets that are already on the phone ( HTC wildfire). i really like having the widget control at my disposal. very good launcher but i toggle so often b/c im still undecided on which i prefere best.